Robb (we called him “Spiderman!”) was as much fun to watch as he was thorough. He did exactly what we wanted, explained what he would be doing and why, and cleaned up when he was done. And he didn’t cost us an arm and a leg. 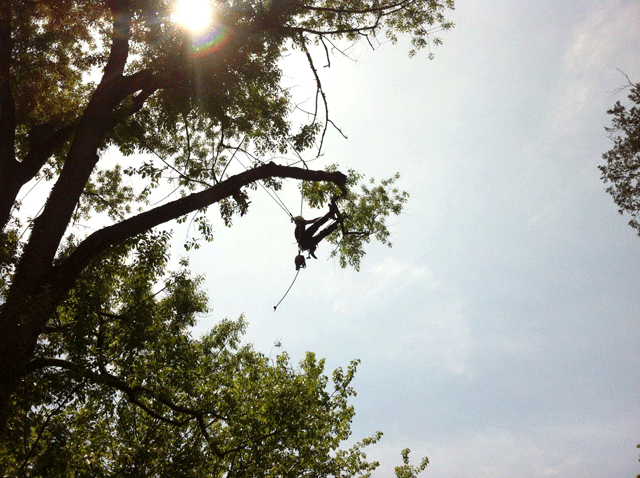 What more could you ask of an arborist?!! Robb has done work for me both on my personal residence and for multiple rental properties. He has trimmed, as well as removed numerous trees, shrubs, and bushes. More than one tree was very close to the house, even encroaching onto the neighboring properties, and Robb was able to remove those trees without any property damage whatsoever. Although his primary business is not lawn maintenance, he even offered to perform that task, knowing that I was having difficulty securing a lawn service for the rental properties. He is courteous, professional, and timely. Having to deal with contractors on a regular basis, I can say that I wish more had Robb’s work ethic and positive attitude. Several times over the past year, we have called on Grace Tree Company for help with various projects. He has ably felled a very large pin oak tree which we felt was nearing the end of its life expectancy. Robb arranged for stump grinding as well. At another time, we needed overgrown shrubs to be taken out. Robb returned with a stump grinder to remove the roots, and to truck the debris away. Recently, Robb planted those areas with new, more manageable shrubs. At another time, Robb noted that a young oak tree needed attention because it had developed a girdling root. "Not a problem," he volunteered, and he made the necessary splaying of the roots to insure that the tree survived. I'd say his judgement is astute, and his efforts, generous. Our experience of working with Robb has been satisfying as he is prompt, knowledgeable, skilful, and creative, and works for a fair price. We recommend him heartily. Robb Gracce is a true pro and a pleasure with whom to work....He clearly knows his trees and is a skilled arborist--showing a real pruning precision and an attention to detail in his work. He listened closely to my concerns, assessed my garden and the various species of trees, and transformed my space.